Fish Tawa Fry is a healthy recipe because here the fish is pan fried with less oil compared to deep frying method. However it is a very tasty and spicy Indian favourite delicacy. 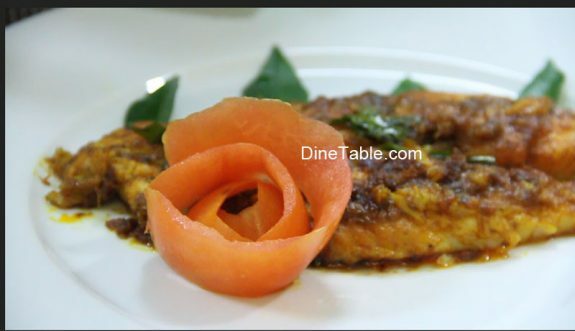 I have used Nirapara Fish Masala to make this fish tawa fry. You can use any fish masala of your choice or add fresh spice powders like chilli powder, turmeric powder, coriander powder and pepper powder in desired quantity. I have used Dory Fish Fillet for making this Fry. This Dory fish meat is white, clean, smooth, and also the flavor of savory. This fish Dory contains nutrients that are good for babies, such as omega 3, DHA and EPA, and also others. In addition to these it lowers high blood pressure, reduce the production of particle causes inflammation, maintain eye health, maintain heart health, improve digestion and nourish muscle. To a hot pan, pour 4 tablespoons of coconut oil. NOTE: Don't fry the shallots till they are golden brown, just make it translucent. 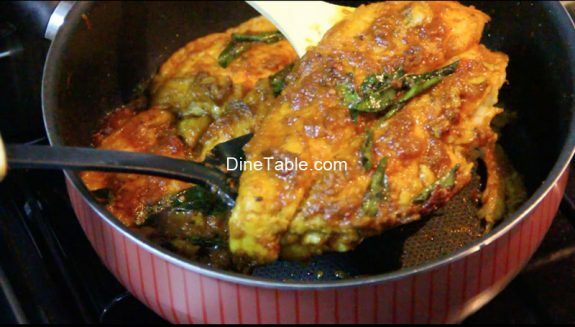 After the shallots become translucent, add ginger-garlic paste, crushed green pepper corns, turmeric powder, fish masala and curry leaves. Slide fish pieces into the masala. Spread masala over the fish. NOTE: Cook the fish on a low flame. Close lid and cook for 5-7 minutes. Flip the fish to cook the other side. Again, let the fish cook for 5-7 minutes. NOTE: Keep the lid open this time. Move the fish to a plate. Decorate with a tomato flower (optional).